First pitch: In the 2009 regular season, opposing batters hit .409 on the first pitch against Saunders. Wait it out: The third time a team faces Saunders in a game, they are hit a combined .302 in the regular season. Think air: Saunders had a 1.32 GO/AO (Groundouts to Air outs) ratio in the 2009 regular season. The league average was 1.06 GO/AO. Saunders lives on the grounder, so think about keeping the ball off the ground. Swipe #2: Opposing teams are successful 82% (14 for 17) of the time when attempting to steal second base. The fastball: Saunders throws his fastball at an average speed of 90.5 MPH and throws it 63% of the time. The curveball: Suanders throws his curveball 15.3% of the time at an average speed of 76.2 MPH. The change: Saunders drops his change 17.9 % of the time at an average speed of 82.5 MPH. The slider: The slider is Saunders least popular pitch. 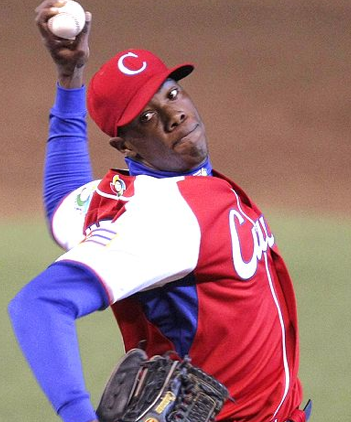 He throws it just 3.5% of the time at an average speed of 81.4 MPH. Whats a NY Note? A NY Note is a question or a thought on the Yankees or baseball in general. When I receive your NY Note I will reply with a blog entry including interesting stats, photos, ideas, etc. that relate to your question or thought. NY Notes are completely free and open, so feel free to be creative, funny, serious or anything you want! Click “Send NY Note” to send your NY Note. If it is sent successfully, you will return to my blog. Your reply will be up soon. Thanks! Yanks pound Angels, one away from the pennant. With the Yankees 10-1 win on Tuesday night, the Yankees are just one win away from their first World Series appearance since 2003. Here are the champs of the game, and the tramps of the game. 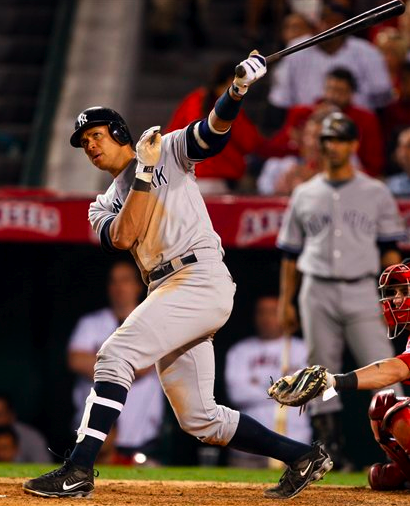 With yet another home run last night, A-Rod now has an RBI in every game this postseason. He has more home runs and RBI’s this postseason than he recorded in his four previous postseasons with the Yankees. His home run was his fifth of the postseason and the third of this series, both career bests. Another “choker” in the postseason has come up big for the Yankees. Pitching on three games rest on Tuesday, CC went 8 innings giving up just 5 hits, 1 run, 2 walks and 5 strikeouts. 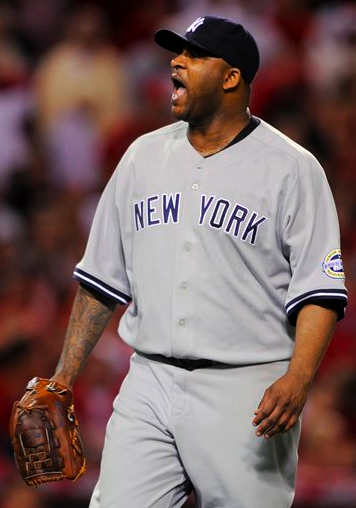 Sabathia has an ERA under 1.4 this postseason and a WHIP of .750. Chances are we won’t see Sabathia again in this series. After a great season against the Yankees, pitching to an ERA of 3.20 in 3 regular season starts, the young lefty struggled in his postseason debut in Anaheim. Kazmir went just 4 innings, giving up 6 hits and four walks while surrendering 4 runs. His control was just not there, and the results reflected that. Just a couple of weeks after a horrible foul ball call in the ALDS, the umps didn’t have a much easier time tonight. Starting with a missed call on a pick off at second, the umps continued to miss relatively easy calls throughout the night. Swisher was called out on a sac-fly saying he left to early, when replays showed that not only did he not leave early, but the ump wasn’t looking anywhere near the play. Later on, an easy double play call was missed, where only one of the two out runners were called out. Ultimately, none of the calls lead to any runs, but MLB should certainly look into these umps. Holding down this Yankee lineup when trying to bridge 5 innings is not an easy task, but this Angels pen had big trouble holding the score. Santana was the one bright spot out of that pen. The combination of Bulger and Palmer gave up 5 runs in just 1 2/3 innings. That was the defining factor of game 4. Girardi’s decisions cost Yankees game 3. Just a few days after the heroic game 2 in New York on Saturday, the Angels and Yankees put on another show Monday afternoon. This time in Anaheim. The Yankees had the early lead, on the back of three solo home runs. After blowing a lead and coming back, the score was 4-4 as the two teams entered extra innings for the second game in a row. After David Robertson recorded two quick outs in the bottom of the 11th, Girardi decided to bring in Aceves. Aceves then surrendered a single then a RBI double to win the game for the Angels. After the game Girardi said that he “liked the matchup better,” with Kendrick and Mathis, the next two hitters. To show that, they used data from 1999-2001 to find the best batter vs pitcher matchup. That matchup was Luis Gonzalez vs Andy Ashby. In 1999-2001, Gonzalez had a wOBA (weighted on base average) of .798 against Ashby. The interesting thing is that in the next year, 2002, Gonzalez hit a much lower .300 against the same pitcher. That isn’t just a fluke, because the top 20 batter-pitcher matchups all had the same result. What does all of this mean? It means that no matter what the matchups are, you can’t expect it to withstand in any given at bat. You should always expect a batter to hit at his norm, rather than his numbers against a certain pitcher. In this case, Aceves had never faced Kendrick and Mathis was 0 for 2 in his career against Aceves. We don’t even need any data for that. That is not even close to enough information to even argue that the matchup is better, which we just established wouldn’t mean anything anyway. Along with that mistake came two others. Gardner pinch ran for Matsui and was caught stealing on a pitch out. I had said right before that the Angels would pitch out on the first pitch. They did and Gardner was thrown out. If something is predictable, don’t do it. More recently in game four, Jeter was running on the first pitch and was picked off. Girardi has become to predictable. All I am saying is that some 15 year old kid (that’s me) should not know more than the manager of the New York Yankees. If I were the manager, that game would not have ended in that inning, and who am I? It’s debatable how much influence a manager really has. But one thing is for certain: It takes a great manager to make a bad team win, and a really, really bad manager to make a good team lose. And Girardi is a really, really bad manager.